The Journal of Retina Vitreous is a scientific journal which publishes reviews, original case reports, clinical studies, clinical research, experimental and laboratory research, literature abstracts, letters to the editor and contemporary medical issues. The journal aims to reach every medical institution and personnel nationwide and internationally. Manuscripts are considered for review only if they have not been published previously elsewhere or are not currently under consideration in other journals.The signed statement of scientific contributions and responsibilities of all authors is required. Only those abstracts presented at scientific meetings could be accepted provided that the information is written as a note. The submitted manuscript will be published after editorial and scientific board review and proper changes are done by authors. After the submission of the manuscript, none of the authors can be deleted, no new author can be added and the order of authors can be changed without the written approval of all authors. The first author of the paper accepted for publication in the Journal of Retina Vitreous should be in consent of that editor can make corrections without changing the main text of the manuscript written either in Turkish or English languages. The authors should acknowledge and provide information on grants, contracts or other financial support of the study provided by any foundations and institutions or firms. The referees board that will be effecting the editor’s choice is selected from the advisors mentioned in the journal and if necessary from the independent reviewers. The priority in acceptance of manuscripts for publication is given for their originality, high probability of citation and high academic quality. Publication languages are Turkish and English. Articles, must be installed according to the procedure of the journal’s online manuscript submission system, but the publication rights release form signed by all authors and editorial covering letters are printed or sent by fax. Manuscript format should be in accordance with Uniform Requirements for Manuscripts Submitted to Biomedical Journals: Writing and Editing for Biomedical Publication (available at http://www.icmje.org). Copyrights of the accepted manuscripts belongs to the journal. Authors have the scientific and legal responsibility of the papers. Rejected manuscripts, figures and photographs will be returned to the authors after receiving a written request. 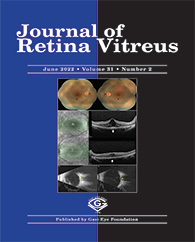 Authors should be subscribed to the Journal of Retina Vitreous for their manuscripts to be published. Ethic responsibility: The journal searches for conformity to the provisions of the Declaration of Helsinki (http://www.wma.net/e/policy/b3.htm) in all clinical studies. For this type of studies, authors must state in the “Materials and Methods” section of the manuscript that the protocol for the research project has been approved by an Ethics Committee of the institution within which the work was undertaken. In “Case Reports” and manuscripts any documents concerning patient identification should not be used. An “informed consent” must be obtained for the informations and documents of patients that are to be used and this must be stated in the “Materials and Methods” section. If there is animal experiments involved, the study must be in compliance with ethic regulations “Guide for the Care and Use of Laboratory Animals” (www.nap.edu/catalog/5140.html) and authors must state in the “Materials and Methods” section of the manuscript that the protocol for the research project has been approved by an Ethics Committee. For experimental and clinical studies involving drugs, compliance with Republic of Turkey Ministry of Health’s regulations and permission from an ethical board must be stated. All manuscripts must have a sentence indicating whether any authors have a proprietary interest (direct or indirect, a product or a company, consultation or other terms). It is the author’s responsibility to ensure that the manuscript is in compliance with ethical rules. Epidemiologic and statistical assessment: All original research articles should be assessed statistically and should be reported by a proper plan and analysis. Research articles should be evaluated by a biostatistics specialist before submitted to the journal and “approval of the specialist” should be mentioned in the covering letter. Proper use of Turkish language is of special importace. Turkish Language Institution dictionary (http://www.tdk.org.tr/sozluk.html) and orthography guide together with dictionary of ophthalmology terms should be taken as basic for literary language. English abstracts should be evaluated by a language expert and the approval of the expert should be mentioned in the covering letter before submitting to the journal. Literary changes can be made in submitted manuscripts without changing the main text by the publication board. A) Clinical Studies: The prospective-retrospective and every type of experimental studies are suitable for publication. Manuscript should not exceed 7000 words and should be accompanied by necessary number of tables and graphics. B) Case reports: Interesting from diagnostic and educational point of view case reports concerning seldom, those one that usually diagnosed and managed with difficulties are published. Case reports should be supported with appropriate number of photographs and diagrams. Parts: Abstract (unstructured), Key words (Turkish and English), Introduction, Case Report, Conclusion, References. C) Review: Review is prepared by authors or by invited authors. The author should be an expert on these topics or have references on these issues. This manuscript should contain the newest and final information on knowledge or topics, which are used in clinic, discussing and evaluating them. Word count is limited by 7000 and number of references is limited by 50. D) Photo Essays: The Journal of Retina-Vitreous accepts manuscripts for consideration as photo essays. These essays include the visual presentation of material where the primary emphasis is on the images. These images can include color images, angiograms, optical coherence tomography, histologic sections, x-rays, ultrasounds, and other studies. The images can be an outstanding presentation of classic findings, atypical findings or new findings, but, the primary emphasis should be on the images. These are not case reports, but rather visual presentation of material as a teaching tool. The images need to be of the highest quality. The accompanying manuscript should be limited to a total of 300 words. A maximum of 5 separate images and 5 references can be included. Bulletins: The announcements of scientific ophthalmological meetings are published. The submitted manuscripts should be in below-mentioned appropriate format. • Article and any tables, figures, images must be installed on the online system. • Including the main article file, author’s name, address and corporate information must not written the any files. This information should be written in the fields specified in the system. • Manuscript should be written in IBM compatible computers using Microsoft Office Word program and, installed on the system with 3 cm margins on each side of the page, double spaces between lines. • A title in Turkish is mandatory for manuscripts prepared in English language. Although it is not necessary, “abstract in Turkish” is required if the publication board decides so. Covering letter: This page is the presentation to the editor and should include the following information: Category of the manuscript, previous submissions of the manuscripts; grants, contracts or any other financial supports, English language check is done, statistical check is done if the manuscript is a research article. Abstracts: Should explain the study as a whole. Turkish and English abstracts should be written on different pages and should not exceed 250 words each. Turkish abstract should include Amaç, Gereç ve Yöntemler, Bulgular, Sonuç subtitles. English abstract should be designed to have Purpose, Materials and Methods, Results, Conclusion subtitles. Key Words: Should be 2-5 key words in accordance with NLM MESH terms (http://www.nlm.nih.gov/ mesh/ Mowser.html) both in Turkish and English abstracts. Purpose: Should be written without a caption, according to the latest literature information to explain the purpose of the study. Materials and Methods: Should be short and explanatory, for classic methods only reference should be mentioned. Results: Should be written without too many details but in compliance with statistical regulations. Conclusion: The results should be discussed comparing with other articles and a conclusion should be reached. References: Should be numbered in accordance with the sequence in the text. In the text the reference numbers should be after period as superscript. If more than one reference is pointing to the same opinion, the consecutive references should be separated with “-” and only the first and the last references should be written. If the references are not consecutive each one should be separated with “,”. References should be on a separate page and written with double space between lines. While writing the references the first three authors should be written. If there is more than three authors, the authors other than the first three should be referred as “ve ark.” or “et al.”. The journal names should be abeviated as in “Index medicus”. Presentations in scientific meetings, personal experience, unpublished papers and abstracts can not be reference but they can be cited in reviews. Examples for reference writing An article: Atmaca LS, Idil A: Excimer laser. T Oft Gaz 1992;22:293-300 Chapter from a book: Schatz H: Fluorescein angiography: basic principles and interpretation. In Ryan SJ: Retina The CV Mosby Co. St. Louis, 1989, Vol 2 P:14-41. Tables/ Figures/ Diagrams: All figures and diagrams should be on different files with titles and numbered in accordance with the sequence in text. The abeviations should be explained in legends. If a previously published table/ figure/ diagram is choosen, a written permission should be included. Legends should be written. Photographs: The photographs must be recorded to high resolution quality in separate files . They should have enough contrast so that the details should be seen clearly. The captions of the photographs should be written end of the main text file. Abeviations: In the first appereance of the term the abeveation is written in paranthesis and can be used throughout the text.